If a restaurant is the nexus between food and wine then Hide is London’s most important opening this year. Born with a platinum spoon in its mouth, Hide has everything: the location, the chef, the staff, the decor, the wine and behind it all, money... a lot of money. That is no shoo-in for success, but it helps. Given how Hide’s existence stems from wine, it is likely to become an oenophile Mecca, and I have a duty to give Vinous readers the lowdown. Allowing them six weeks to settle in, I wanted to see whether Hide would impact London’s restaurant scene in the same way as Hedonism did for fine wine retailing. Hide is essentially the culinary extension of Hedonism, the double-floored Mayfair wine emporium bursting at the seams with refulgent d'Yquem verticals and jeroboams of First Growths that cost the same as a terraced house in Grimsby (and taste much better). Rich, well-travelled, thirsty clientele buy their wines from Hedonism – so why not open a place nearby where they can drink it? The owner is exiled Russian billionaire Yevgeny Chichvarkin. Splashing down a cool 20 million quid on a former car showroom overlooking Green Park was like rooting around your jean’s pocket for spare change. With that kind of money you can fork out a “destination chef” to draw the crowds. Enter Ollie Dabbous, who shut the doors on his award-magnet, eponymous restaurant in 2017, a statement of intent insofar that Hide was not intended to be a showboating restaurant for hipsters gorging on pimped-up burgers and there to be seen. Hide caters to discerning gastronomes seeking substance behind the style who demand fine cuisine and know their Claret from Beaujolais. The location is the first thing that catches the eye. Some reviews have waxed lyrical upon the first-floor vista of Green Park, insinuating that you must curry favor to bag a window seat. Piffle. You are basically overlooking the car-park in the direct eye-line of tetchy tourists incarcerated on the upper decks of stationary buses. Hide is a large restaurant split into three levels: “Hide Below” houses a cocktail bar (regretfully I did not have time to dabble, but have it on good authority the drinks are among the best in town), “Hide Ground” which serves an all-day à la carte menu for breakfast, lunch and dinner and “Hide Above”, the chichi upper floor restaurant which offers a single tasting menu with a vegan alternative for those who prefer ingredients without mothers. I warm to the idea that everyone is at Hide for different reasons, whether it is a cheeky pre-club cocktail, a casual lunch with mum, a romantic dinner or in my case, as a gourmand/oenophile. Apparently as far back as the planning stage, the owners discussed treating “Hide Above” as a separate entity for the purposes of restaurant awards. The car lift that occupied the original car showroom was left intact, so if Kanye, Gigi or Leonardo wishes to avoid paparazzi, they can ostensibly drive to their table. I walked. Hide looks that part. It has an autumnal feel, plenty of high quality blonde wood polished to an inch of its life, wooden chairs and tables equipped with discrete slide-out drawers housing phone chargers, top secret documents and so forth. The private room has a gorgeous flower and plant ceramic bas-relief nicked from the Tate Modern. The heart of Hide is the stunning twisting wooden staircase straight out of a fairytale castle – a little tricky to navigate when descending after a bibulous dinner perhaps? You feel as if the entire restaurant has been carved out of a single tree. It has a warren-like feel, the dimly lit interior lending Hide a sense of coziness, enhancing the feeling of being at the center of London glitz. Dining on a Thursday night, there was a buzzy atmosphere, the hubbub pitched just right: loud enough to foment a feeling of being in the right place at the right time, but not loud enough to reply “What d’ya say?” every time you speak. I must comment on the staff – they were impeccable. Polite, informed, friendly, attentive but never overbearing. You can spend all the money you want on a restaurant, but if your staff is not Grand Cru, then that is money down the drain. Everyone is young, bright and busy-tailed. My sommelier wore a Dali moustache and might well model for GQ in his off-hours. Hide have obviously recruited the best, from receptionist to waiter to sommelier and frankly, that’s half the job done. Apparently there are 200 employees on the payroll. Arriving at 7:30pm for an 8:30pm reservation, a table was free so we started early, a blessing since the tasting menu demands three hours and we had a last train to Guildford to catch, lest we spend the night under Waterloo Bridge. We began with a mixture of entrées commencing with a revivifying chilled cucumber, elderflower and lemon verbena broth; a plate of vegetables (carrot, radish, lettuce and marinated courgette folded like a miniature spring roll) and what the menu refers to as “Flesh and bone”: pork jowl with caraway and juniper, goose with fenugreek and sage wrapped around fake bone and bird feather. 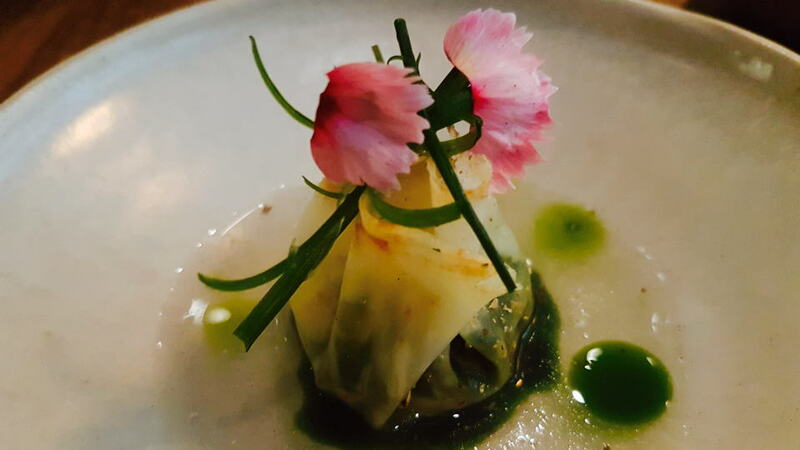 All delicious, quite light and healthy, an opening that eased us into our next course, an outstanding dumpling containing celeriac, avocado and angelica seed in a pine consommé. This was exceptional. The texture of the dumpling was nigh perfect and I loved how it gently collapsed so that the vegetables merged with the broth. For a flickering moment I considered life as a vegan, then I came to my senses. The dumpling was accompanied by really quite wonderful moist bread that is baked on the premises, particularly the irresistible aniseed-laced roll. Next came raw tuna with prickly ash and Exmoor caviar, neatly piled on a green leaf atop a bowl of ice. Now, we need to talk about this dish. The cubes of tuna were not fatty or oily enough for my liking, and when diced into small pieces, the tuna cubes are a little dry. They just need to aim to a different part of the tuna. We suggested to the waitress that they try Atari-Ya in West London, which supplies much of the Japanese community. Lo and behold when I later study the Hide website, Atari-Ya are listed a supplier. Anyway, I would have liked a little more generosity with the caviar and more of the Japanese dashi dressing just to lift the flavor. Good idea, simple, but it needs to be executed to a higher standard. One of the highlights and most talked-about dishes is simply titled “nest egg”. 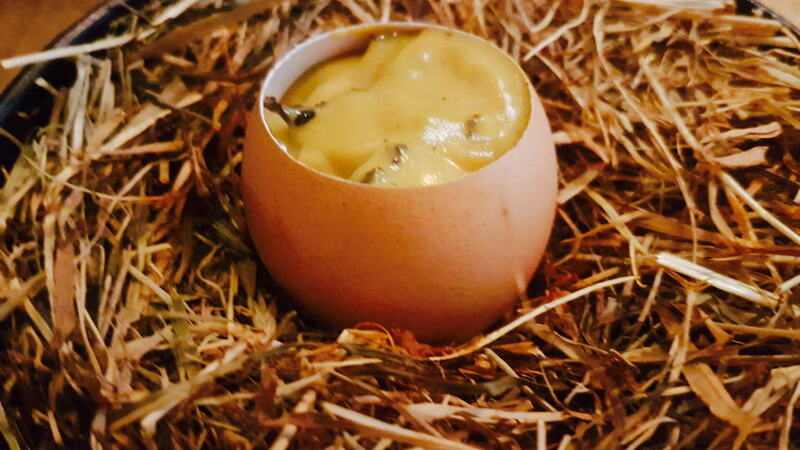 The trepanned egg sits in a bowl of hay and the gooey yolk is mixed with toasted mushroom, smoked butter and parsley, perhaps a cousin of chef Michel Guerard’s signature truffle egg and soldiers, still one of the greatest dishes known to mankind. You don’t want it to end as you scrape your spoon around the shell’s interior to savor every morsel. We shared an optional “Cornish fish in 2 services”. It was kind of “do-it-yourself bouillabaisse”: fish broth with squid ribbons, rouille in a sea urchin shell mixed with plaice, mussels, squid, oyster and sea urchin. This was just wonderful, a seductive mélange of seafood that set us up nicely for the following pescatarian course. I opted for the red mullet with baked bread and smoked saffron sauce. The mullet was cooked to perfection, the skin with just the exact amount of crispness, whilst the flesh was moist inside. 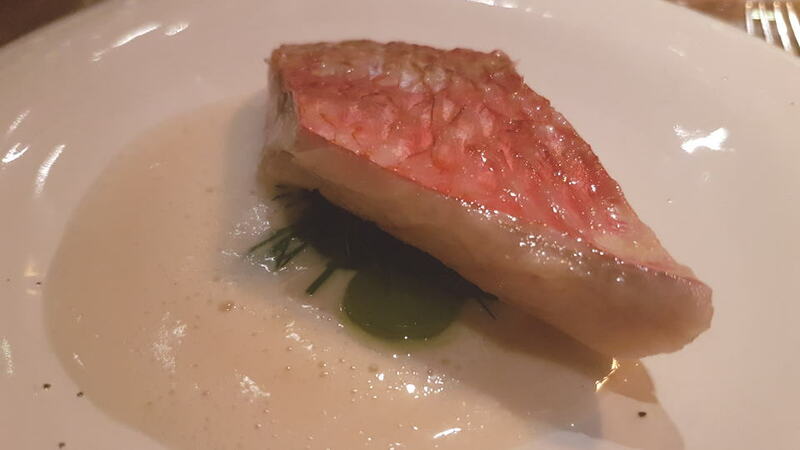 On the other side of the table: steamed day-boat turbot with nasturtium broth – delicious, yet not quite as compelling as the red mullet. I would have liked just a little more seasoning here, but again, cooked so that it melted in your mouth. Moving into the meat course, the roast dry-aged Goosnargh duck was (again) pink and moist though again, a soupçon more seasoning in the sauce would have been welcomed. Alternatively, there is the barbecued organic Herdwick lamb with asparagus and savoury pine nut praline. The lamb was excellent, although it did not quite gel together as well as the duck – the charred asparagus was delicious, albeit striking a dissonant chord with the meat. This dish just needs a bit of tweaking. We skipped the optional cheese course and went straight into dessert. For some reason the menu does not quite call for fromage. The garden ripple ice cream was served on top of a block of ice that encased what looked like an orange gerbera. Why? I don’t know. Why not? It was fantastic. Imagine an ice cream van skidding off a country lane into a green meadow. The dish comprised of a Granny Smith apple and sorrel sorbet with a sheep’s yogurt ice cream. Malic sharpness of the Granny Smith sublimely interplayed with the sorrel, the ice cream lending countervailing sweetness. Très bon! Next came what the menu laconically describes as just “coconut”. 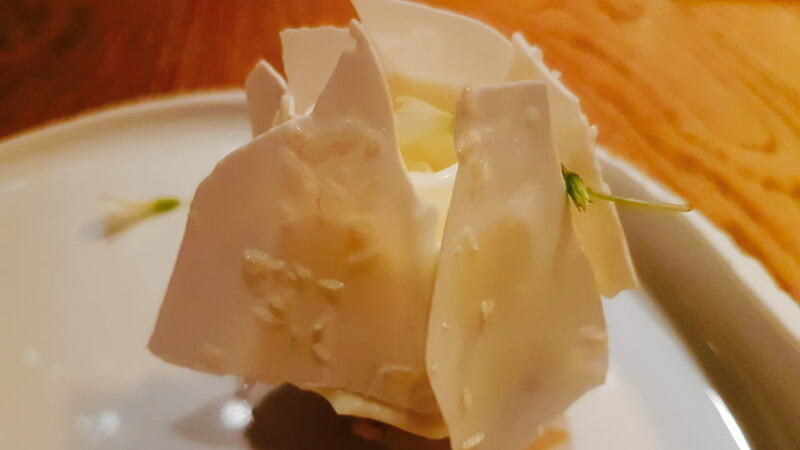 Of course, it’s more than a spooning of coconut out of a shell; rather a three-way origami-like construction of coconut (meringue, shaved and flakes) topped with lime caramel and butterfly sorrel. In theory it should have been boring as it is ostensibly coconut with coconut and coconut, but the textures created a pleasant umami sensation, while the lime caramel imparted necessary acidity to prevent taste-bud ennui. Maybe I am a sucker for coconut, but I loved it. On the other side of the table came a jasmine and wild pea flower Religeuse with cold-brew jasmine tea. It looked like a pale blue macaroon on a throne and tasted wonderful, although as a man of simple taste, I preferred the coconut. We finished with burnt liquorice root that speared a burnt star anise marshmallow: subtle in flavor to the point of being forgettable, not quite the bravura finish the tasting menu deserved on my side. Much better was the crisp cocoa tuile topped with gianduja (a sweet hazelnut based chocolate spread from Turin), cremeux and caramelized hazelnut. We must discuss the wines. Firstly, you have the comprehensive restaurant list, the bottles kept in a basement below. The selection here is very well chosen and I felt reasonably priced, an eclectic collection from New and Old World. Refreshingly, Hide is not hidebound to French classics. That said, I doubt there are many restaurants that can offer such a deep assortment from the other side of La Manche. The sommelier presents an iPad with approximately 6,000 wines stocked a couple of blocks away at Hedonism, available if you wish, just 15 minutes there and back for a £30 mark-up. So if you really do want to spend almost six-figures on that 1847 Yquem, then you can (hopefully accounts will overlook my little extravagance – I’ve never drunk the 1847 before). 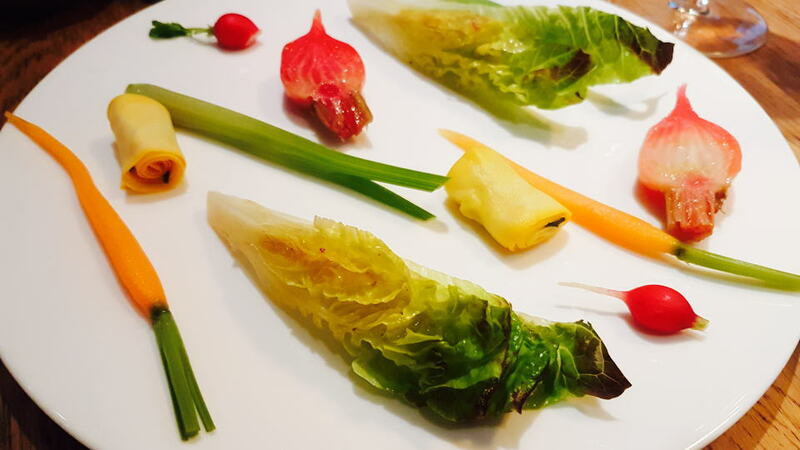 There are three wine-pairing menus, the most deluxe at £295.00 per person. Not cheap, though on the day I visited they had just introduced none too shabby glasses of Sine Qua Non and a 2014 Echézeaux from Domaine de la Romanée-Conti. One aspect that I appreciate is Hide’s openness to B.Y.O. Thirty pound corkage is very reasonable for this kind of restaurant and obviates awkward negotiation or embarrassing refusal. Best advise them in advance and of course, not roll up with a bottle of Blue Nun but something reasonably special. It is also etiquette to order additionally off the list, as I did (and no, I didn’t really order the 1847). We started with a demi-bouteille of Billecart-Salmon Rosé: a safe option, but it does the job, even though I would say that a full bottle is better. With a wine list that extends to thousands of labels you can easily get lost, so since I will soon be in the Cape, I scoured the South Africa list. I was pleased to find a selection of lesser-known names such as Restless River and Thorne & Daughters, and chose the 2016 Cartology Bushvine from Alheit Family. Chris Alheit’s Chenin Blanc-based white blend showed brilliantly: taut and focused on the nose, perhaps stricter than previous vintages, with scintillating tension and energy on the palate. Finally, my own bottle. 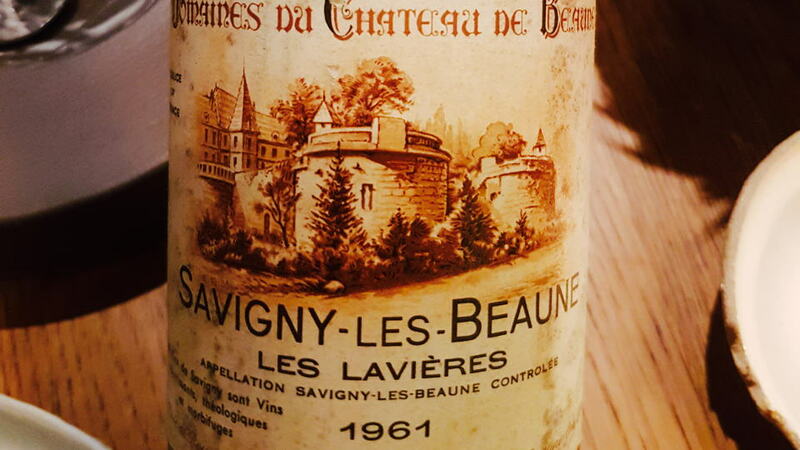 The 1961 Savigny-lès-Beaune Les Lavières 1er Cru from Bouchard Père & Fils was perhaps a risky move since old Burgundy can be hit and miss, especially since 1961 is not a great vintage in Burgundy as it is Bordeaux. I had nothing to worry about. Clear and deep in colour, the 1961 had a fabulous mature blackberry, undergrowth and tobacco-scented bouquet that was rustic but so vigorous after 57-years that you had to give it applause. Likewise, the palate of this big-boned Savigny lacked the finesse of a nobler premier cru, and yet such is the presence and structure that you easily overlook that shortcoming. Still with adequate grip, there are wonderful rustic red fruits mixed with Earl Grey and light tobacco notes towards the dense finish. Who says wines from Savigny cannot age half a century? So, does Hide live up to the billing? You could argue that they have it easy. Discussing Hide with another restaurateur, he justifiably asked: where is the struggle and where is the story, the journey, behind success? Fair point. On the other hand, London is littered with restaurants financed by wealthy backers that are gaudy, loud, pretentious, with no style and shoddy food for those who do not care what they put in their mouths. Hide is not that. The restaurant itself has been cleverly and thoughtfully designed. The menu is not perfect as some restaurant critics have suggested – it needs tweaking here and there – but this is the early stage when that can be addressed. As such, whilst Hide is easily one-star standard, if they want a second one then a few things need a nip and tuck. At £95.00 per person, Hide is not cheap, and even though I paid corkage and kept within a budget, it is almost unavoidable to rack up £200 per person. Sadly, that is now standard for central London. For wine-lovers, Hide is a must-go. Sure, if you want to blow a ridiculous amount of money on a big label then be my guest and let me know what time I should arrive. However, the sheer size and comprehensiveness of the list means there are pockets of very good value wines from less trendy growers and regions. The world is your oyster. Moreover, there is a wealth of mature vintages that even established restaurants of similar standing cannot offer. I am intrigued to return to Hide after a few months to see how the menu has evolved. Maybe I will use the car-lift and drive to my table.